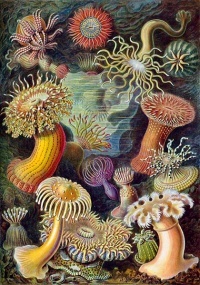 The 49th plate from Ernst Haeckel's Kunstformen der Natur of 1904, showing various sea anemones classified as Actiniae. The Appian Way as it appeared in Piranesi's imagination (1756), from Le Antichità Romane. An Illustration is a visualization such as a drawing, painting, photograph or other work of art that stresses subject more than form. The aim of an illustration is to elucidate or decorate a story, poem or piece of textual information (such as a newspaper article), traditionally by providing a visual representation of something described in the text. Illustrations can be used to display a wide range of subject matter and serve a variety of functions. The earliest forms of illustration were prehistoric cave paintings. Before the invention of the printing press, illuminated manuscripts were hand-illustrated. During the 15th century, block books illustrated with woodcut illustrations became available. The main processes used for reproduction of illustrations during the 16th and 17th centuries were engraving and etching. At the end of the 18th century, lithography allowed even better illustrations to be reproduced. The most notable illustrator of this epoch was William Blake who rendered his illustrations in the medium of relief etching. In the early 19th century the proliferation of popular journals, which often serialised novels for mass-circulation, produced a boom in popular illustration. The medium moved away from steel engraving which was the standard in the early century towards wood-engraving which could more easily be incorporated into pages of text. Book and journal publishers would employ workshops of wood-engravers to render artists' drawings onto polished blocks of fine-grained yew or box-wood which could then be locked directly into the printing-chase with the metal type. Notable figures of the early century were John Leech, George Cruikshank, Dickens' illustrator Hablot Knight Browne and, in France, Honoré Daumier. The same illustrators would contribute to satirical and straight-fiction magazines, but in both cases the demand was for character-drawing which encapsulated or caricatured social types and classes. The British humorous magazine Punch, which was founded in 1841 riding on the earlier success of Cruikshank's Comic Almanac (1827-1840), employed an uninterrupted run of high-quality comic illustrators, including Sir John Tenniel, the Dalziel Brothers and Georges du Maurier, into the 20th century. It chronicles the gradual shift in popular illustration from reliance on caricature to sophisticated topical observations. These artists all trained as conventional fine-artists, but achieved their reputations primarily as illustrators. Punch and similar magazines such as the Parisian Le Voleur realised that good illustrations sold as many copies as written content. The American "golden age of illustration" lasted from the 1880s until shortly after World War I (although the active career of several later "golden age" illustrators went on for another few decades). As in Europe a few decades earlier, newspapers, mass market magazines, and illustrated books had become the dominant media of public consumption. Improvements in printing technology freed illustrators to experiment with color and new rendering techniques. A small group of illustrators in this time became rich and famous. The imagery they created was a portrait of American aspirations of the time. A prolific artist who linked the earlier and later 19th century in Europe was Gustave Doré. His sombre illustrations of London poverty in the 1860s were influential examples of social commentary in art. He remained with the medium of monochrome engraving in his later more fantastical work, but other artists were discovering the possibilities of color, particularly under the influence of the Pre-Raphaelite painters and emulations of hand-printing techniques by the design-oriented Arts and Crafts Movement. Edmund Dulac, Arthur Rackham, Walter Crane and Kay Nielsen were notable representatives of this style, which often carried an ethos of neo-mediævalism and took mythological and fairy-tale subjects. By contrast the English illustrator Beatrix Potter based her colored children's illustrations on accurate naturalistic observation of animal-life. The opulence and harmony of the work of the "golden age" illustrators was counterpointed in the 1890s by artists like Aubrey Beardsley who reverted to a sparser black-and-white style influenced by woodcut and silhouette, anticipating Art Nouveau, and Les Nabis. American illustration of this period was anchored by the Brandywine Valley tradition, begun by Howard Pyle and carried on by his students, who included N.C. Wyeth, Maxfield Parrish, Jesse Willcox Smith and Frank Schoonover. A movement was started in Latin America by Santiago Martinez Delgado who worked in the 1930s for Esquire Magazine while an art student in Chicago, and later in his native Colombia with the Vida Magazine, Martinez a disciple of Frank Lloyd Wright worked in the Art Deco style. Also in the 1930s the influence of propaganda art and expressionism was felt in the work of the British freelance illustrator Arthur Wragg. His stylised monotone shapes suggested the block-printing techniques used for political posters, but by this time the technology of transferring artwork to printing plates by photographic means had advanced to the extent that Wragg could produce all his work in pen and ink. Disregarded in their own day, the styles of illustration which have since come to characterize the 1950s and 1960s are magazine advertising and comic art. These styles even began to flow back into the mainstream of fine art in the work of Andy Warhol and Roy Lichtenstein (both of whom had worked as commercial illustrators). Not so admired have been the various styles of illustration associated with pop album cover in the 1970s, often based on airbrush techniques. Starting in the 1990s, traditional illustrators confronted a challenge from those using computer software such as Adobe Illustrator, Photoshop, and CorelDRAW. The use of Wacom tablets and similar apparatus also increased the ability of drawing and painting directly in a computer. Today, many illustration students are made aware of the technology available, with equal emphasis placed upon more traditional illustration techniques. As a result, traditional and digital techniques are often used in conjunction with each other. While illustrations have been previously been considered just a small part of the creative and entertainment industries, they are becoming a new and significant factor in industries such as video games, movies, animation, advertising and publishing, the former three known for their use of concept art in pre-production. Today, there is a growing interest in collecting and admiring original artwork that was used as illustrations in books, magazines, posters, etc. Various museum exhibitions, magazines and art galleries have devoted space to the illustrators of the past. In the visual art world, illustrators have sometimes been considered less important in comparison with fine artists and graphic designers. But as the result of computer game and comic industry growth, illustrations are becoming valued as popular and profitable art works that can acquire a wider market than the other two, especially in Korea, Japan, Hong Kong and USA. Unless indicated otherwise, the text in this article is either based on Wikipedia article "Illustration" or another language Wikipedia page thereof used under the terms of the GNU Free Documentation License; or on original research by Jahsonic and friends. See Art and Popular Culture's copyright notice. This page was last modified 07:26, 25 April 2014. This page has been accessed 11,140 times.